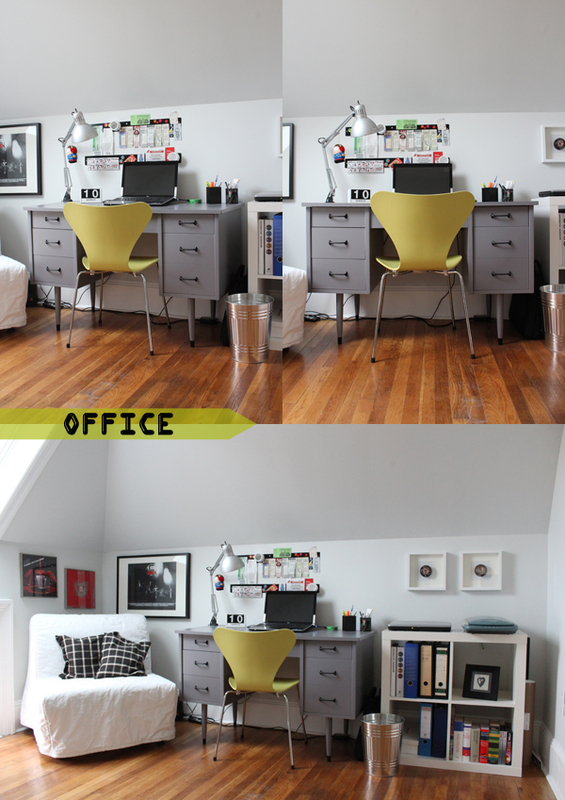 In February I shared how I painted a desk that had a beat up plastic laminate finish. The desk I scored for free on craigslist and a couple coats of paint turned it from drab to looking fresh again. Because P's old chair was broken and wobbly we checked out the Design Within Reach Outlet that is close to where we live and found this Series 7 chair. It was marked down quite a bit and they also had a 20% off sale that weekend. P had a gift certificate as well he ended up spending only about $50 on the chair. And the chartreuse color looks great in combination with the grey of the desk. Now you can also see where the framed pucks hang. It's so great that each of us has a room for ourselves, it's a solution that works for now. Who knows what we might need the space for in the future. Happy three day weekend everybody! His office looks great! Really neat that you each have your own separate spaces, too. That's helpful, I bet! Also, way to go on scoring that chair at such a discount. I love when things are on sale and then have extra discounts on top of it. Good to know that the West Elm chair I picked up at one such sale is a blatant rip off of the Series 7 chair! I didn't know before! I love the idea of sending you our work spaces. I'm in! I have 2 though, haha. And they're constantly changing. Let me know when you want the pictures by and I'll shoot them over. Cool idea! This really looks great. Well, my work area looks a lot like my dining table...oh wait, that's because it IS my dining table. But if, er when, I finally get my home office in place, I will definitely share with you. Happy long weekend to you too! Theresa, I would love for you to participate! It doesn't matter if you already showed a picture on your blog. A perfect and sweet office decoration pictures. I really love it.